Great potential for this sibbing of Paph. 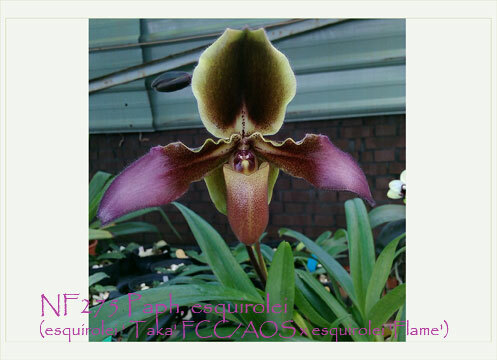 esquirolei due to its amazing pod parent, ‘Taka’ FCC/AOS ! That superb quality flower exhibited a glossy dark dorsal sepal with a green margin, extremely broad undulating purple-maroon petals tipped with fuchsia and a diamond dust flower texture. This species also won the highly coveted Best Paphiopedilum Species honor at the 18th World Orchid Conference in Dijon, France. An easy to grow and flower species, this warmth tolerant Paph. makes a beautiful specimen plant and is Highly Recommended !